The snow swirls wildly. Whiteout conditions then subsume the land. But just as soon as the snow squalls came, the sun blinks and out, and the snow clouds dissipate. The dusting left on the dormant grass melts away. It is the sallow grass of winter. But soon it will be greening, for we have entered into that oddball month that runs from late March to late April, when the days switch from balmy sweetness of coming spring to the driving chills of winter. The two forces will war against each other over the next month. Spoiler alert: the warm and balmy beats the dagger cold in the end. This is the time of the great calving. Not of glaciers or of wild beasts but of the beef cattle that move their way through the green pastures, munching away at their forage, getting fat as they fart and belch and chew cud in the sunshine. The agrarian life is in a moribund state here in North-Central West Virginia. The old ways of farmers turning out a few beef cows with calves and keeping a few head of sheep are slowly but surely in decline. Georgia and Tennessee are better lands for beef, and the price of wool is but a pittance. Big agribusiness works the more fertile lands of the Midwest, Great Plains, and California, and the mixed operation little hill farmer of the Alleghenies is left way behind. Only a few souls cling to the business of cattle. Virtually none do it full-time. My own grandfather on my mother’s side was one of these part-time cattlemen. He was a school bus-driver. He “drove bus” is the way his occupation was described. But his heart was in raising beef cattle. He was not a man of great education, but he was every bit as into improving his strains as Robert Bakewell or Thomas Coke. He was always looking for a fine bull to put to his cows, and he never kept any scrub cattle. But now the old farmers have gone. Their children have gone off to make their fortunes elsewhere, and by now, several generations have been removed from that lifestyle. Children’s hands, which once milked dairy cattle, now caress smart phones and video game controls. To most of us, this world as a foreign as Outer Mongolia. But I often drive this stretch of rural road, though, where the farmer still turn out their cattle into roadside pastures. And in between the March snow squalls, I slip along this road. The cattlemen along this road keep only “black Angus” or the crossbred form known as a black baldy. These Scottish cattle grow thick coats during the winter chill, and although they are hornless, they sort of make me think of bison when I see them. Their shaggy hides just have that sort of primeval look to them. And March is the time when the calves drop. They fall black and wet onto the yellow grass, and their mothers stand over them, licking them with the deep cleaning, stimulating strokes of their muscular tongues. And then they rise from the grass and drink the colostrum, while the snow flies all around them. The cattlemen breed the cows to give birth in March, so the calves can grow and mature on the green grass of spring. That way, they can get top dollar at the autumn livestock markets. There is a toughness in these cattle, though they are so carefully bred for their fine marbled beef, that they drop their young into this time in which the winter chills square off against the coming spring warmth. This scene feels ancient, but in long history of the Alleghenies, it is but a brief footnote. Mammoths and mastodons once dropped the calves here, as did the ancient North American bison. And when the Europeans came, the forests were full of elk and modern-day bison, and they too had their young in the spring sunshine on these glady hills. And 50 years ago, the Angus weren’t grazing the hillsides. The very stately English Herefords were the beef breed of choice, and a hundred years ago, the most farmers kept shorthorns, which are always called “Durhams” in West Virginia. Cross them with Jersey or Holstein, and you’ve got a nice little dairy cow. The rest can be killed for beef or sold to market. As I drive down the road, I come to pasture that is enclosed by an 8-foot fence of woven wire. When I first saw this fence, I thought it odd. Most cattlemen just put in four strands of barbed wire, and if that doesn’t hold the cows back, a solar paneled electric fence certainly will. But here, the fence is so elaborate, and I never could figure out why it was so. And then one day, I saw a them standing along the fence nearest the road. They were a herd of about a dozen bison. They looked out of place behind the woven wire. 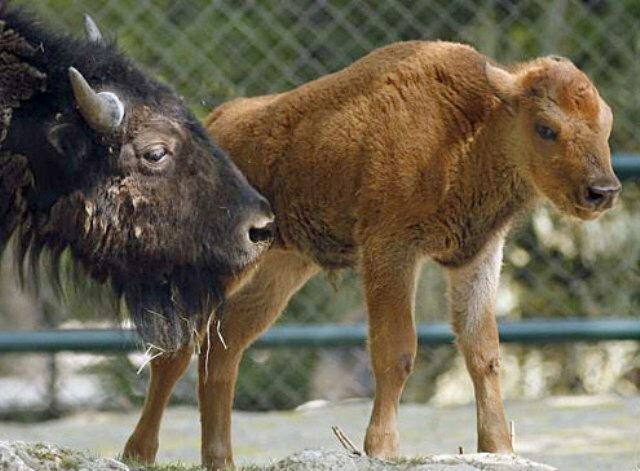 In my mind, a bison is a wild animal, one that our greed largely killed off in the past two hundred years. But on this farm, they have returned, but their reintroduction is ersatz. Two hundred years ago, the bison roamed up from the Ohio River Valley during the early spring to eat the rich mountain grasses, and every winter, they would wander out of the snowfields of the higher mountain into the mild river bottoms. These bison, though, are confined. Sooner or later, they would go to slaughter. Their wildness has been bottled up, but I can’t help but wonder if they would enjoy running loose as their wild ancestors once did. I think of these bison and of these cattle, and I think about the question of permanence. In a thousand years, will this bison or the Angus still be grazing these pastures? Will the pastures even exist, or will the temperate forest absorb the grasslands as they have done with all the old hill farms that have been abandoned to nature? Will the snows of March still come flying in that great whirlwind battle between warmth and freezing chill? Or will the warming climate declare final victory over the March snow? Permanence is illusory. To adhere to that illusion is to become subject to a delusion. Sooner or later, the fracking trucks will come, and if the groundwater gets ruined, these little farms will be gone. Economics and ecology will simply clear it all off, just as these forest bison were cleared off nearly two hundred years ago. So now behold this land of the black buffalo, but don’t blink. It might not be around too much longer. Great PBS documentary. Check it out here! 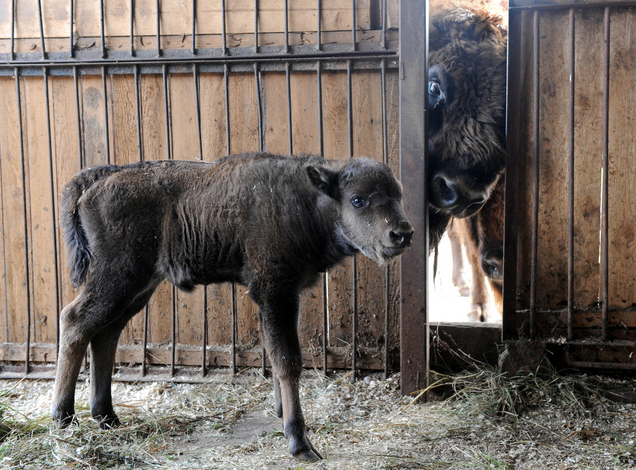 Of course, American bison calves are much prettier.